H.O.P.E. 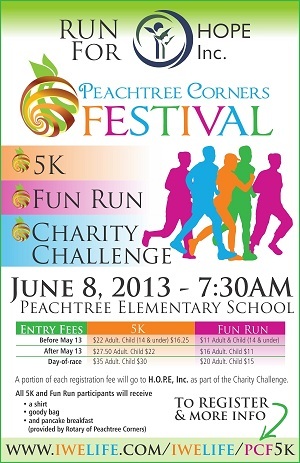 Inc. is excited to join the Peachtree Corners Festival 5K Run on June 8, 2013 as one of their charity partners! The event starts promptly at 7:30 a.m. at the Peachtree Elementary School, 5995 Crooked Creek Rd NW, Peachtree Corners, GA 30092. In an effort to give back to the community, the Peachtree Corners Festival added a special Charity Challenge, giving its community of volunteers, sponsors and participants the opportunity to make donations for the charity of their choice. Through this effort, the Festival hopes to raise over $25,000 for their charity partners, which includes H.O.P.E. Inc.! H.O.P.E. Inc. is taking on the challenge by participating in the run this year and we’re asking for more sponsors! Our goal is to raise $2,500 through this effort! We currently have 13 sponsors and we need more. 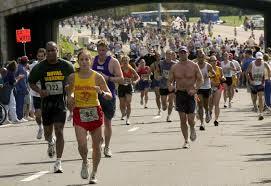 With less than four weeks until the run, we’re asking for your immediate help. As our organization continues to grow, we are always looking for new events and fun ways to continue our mission: to help serve low-income single parents obtain a college degree. By helping to provide these individuals with assistance in subsidized housing, child care, social services, and life skills, H.O.P.E. Inc.’s services will help them to finish their education, earn the skills to become employable, join the workforce and become more productive members of our society. You can be confident that 100% of any donations made to H.O.P.E. Inc., whether small or large, will go directly to help single parents in need. Your donation is going to a great cause and will go a long way in helping us to reach our $2,500 goal! Won’t you consider making a donation today, or sign up to register for the Peachtree Corners Festival 5K Walk on June 8, 2013 right here on our website! So please take the time to sign up here on our website and help us reach our goal of $2,500! Let’s run for the single parents in need of childcare and rent assistance so they can stay in school and create a better life for their families! Please spread the word! Please sign up or donate today! H.O.P.E. Inc. hopes to see you at the Festival on June 8th! Remember that by supporting H.O.P.E. Inc. you are providing hope and help to single parents earn a college degree! Please come out and support us! We’ll have a booth at the Festival and a special “Meet and Greet” session where you have the opportunity to meet with board members, our supporters, sponsors, friends and me. It’s going to be a fun and exciting day as we run for a good cause and help build up our community!